This is what happens when you take a long break from blogging. You log back in and find all these great half finished post ideas! 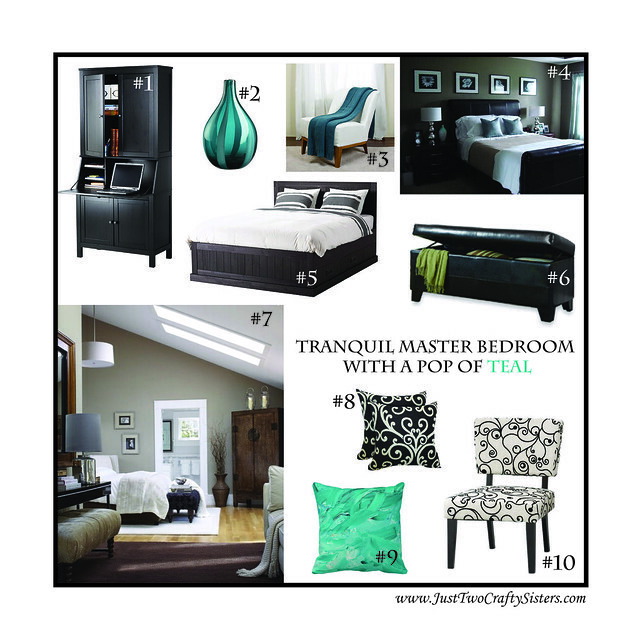 Back in the spring when we were anxiously awaiting moving into our new house, I took the time to brainstorm our bedroom feel and came up with this mood board, calming tones with a pop of teal. 1. First off, we want to create a small office area in one corner of our Master Suite. I love the clean look of having a Secretary desk like the Hemnes Secretary with Add-on Unit from Ikea. A great way to have office stuff accessible, still able to close it away from view too. 2. I am in love with this vase from Crate & Barrel! A vase can be a simple and inexpensive way to add a pop of focus color to any room. 3. Another great way to add that pop of color to a room is through the simple use of a throw blanket over a chair (Link). Plus, if you get cold you always have any extra blanket easy to find. 4. I love the dark bed frame in this bedroom I pinned on my Home Decor-Bedrooms board. The wall color is little dark and too green hued for my taste, but it is still clean and calming. 5. I have really wanted a bed frame with drawers like the Fjell Bed Frame with storage from Ikea. Not only would it provide more storage, but it would help to keep the pups from hiding under the bed when they don’t want to go outside. 6. I love the idea of putting a sweet black leather bench at the foot of the bed, like this great faux-leather one from Bed Bath & Beyond. Great way for added storage of blankets and to create a more completed look to the foot of the bed. 7. My favorite bedroom on my Home Decor-Bedrooms board has to be this beautiful room. I love the colors, the vaulted ceiling and the overall soothing feel it evokes. 8. With the black and white chair already in mind, I like the way the patterned is reversed in this throw pillow so that they play off each other without being match-y. 9. More teal please! This bold teal pilllow is another great way to bring in the accent color of teal. Plus I really love the painted look of the pillow adding extra texture to the look. 10. I bought this chair from Joss & Main right after making this mood board. I am not sure it works completely yet, but worst case it would make a great chair for our guest/craft room and I love the simple black and white pattern. Even though we have about 4 more months until we move into our first home, I keep finding myself day dreaming and planning out each room. To keep me occupied, I have decided to create a few mood boards with ideas for each room to mull over until the big day finally comes. To start this off I have worked on a design for our dining room. We have never really had a dedicated dining room in any of our apartments so this seemed like a fun one to start with. The overall look we want is simple, modern and clean. We want to go with a few bold choices, like navy walls, but pair it with classic simple pieces like white accessories and black furniture. 1. Alex and I have been wanting to paint a room bold, and being that we have always lived in cream, bland apartments together we are ready to step it up in colors in our new home. 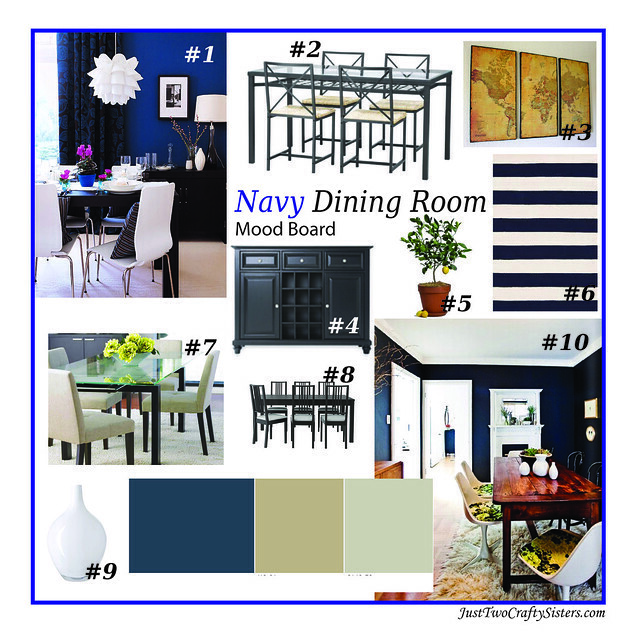 While browsing ideas on Pinterest, I stumbled across Lucyina Moodie Stylist’s Navy Dining Room. I love the black furniture against the bold navy walls with touches of white for contrast. For more dining & kitchen ideas, follow my Home Decor – Kitchen/Dining Room board on Pinterest. 2. Our current dining room table is a hand-me-down, that while practical and looking a lot better after we refinished it 3 years ago, is not really in line with our style. For this dining room I really want a glass table. One option we found is the Granas Table & Chairs from Ikea. What I really like about is the price tag, under $200 for table and chairs. The seats on the chairs do leave something to be desired, but that would be a weekend project changing them out with a nice cream or white padded seat.